Full Moon O Sagashite: Full Moon Debuts! Arina Tanemura’s shoujo manga series originally began as a serialized story in the girl’s magazine Ribon. However, Full Moon o Sagashite quickly found a growing audience and an animated series went into full production. 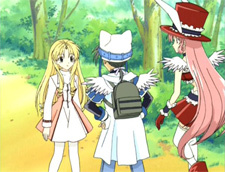 Covering 52 episodes with high weekly ratings, the TV series managed to catch up and even finish the storyline before the final manga was printed. Following 12-year-old Mitsuki Koyama, it’s easy to think she’s just another regular elementary school girl dreaming of being a j-pop idol. Yet Mitsuki has throat cancer and her dream will be unfilled if she has her vocal cords operated on. In come two shinigami who decide to help the girl fulfill her dream of becoming an idol before the cancer takes her life within a year. Viz Media brings Full Moon O Sagashite: Full Moon Debuts!, the second volume in their on-going Shojo Beat series, to the American audience. DVD: Full Moon O Sagashite: Full Moon Debuts! Episode five begins, as all episodes do, with a recap of the last episode and a cutesy reminder to sit back from the television set. Mitsuki Koyama is a normal girl, but thanks to the two shinigami watching over her Mitsuki can be transformed into 16-year-old singer Full Moon. Full Moon’s manager Masami Oshige calls Mitsuki to tell her about an interview and photo shoot they need her for the next day. Mitsuki and her two shinigami, Takuto and Meroko, pack for a fun day in the beautiful countryside next to a lake. After wandering around for a little while to enjoy the fresh air, it’s time for Full Moon to start her interview. Takeda is a kind interviewer from MYOJO magazine and Full Moon gushes at the chance to be in the popular magazine about famous singers. The interview leaves Full Moon a tad nervous as she tries to answer each question with the pre-prepared answers the trio had come up with the night before. After all, no one wants Full Moon’s secret of really being a 12-year-old girl to get out. With the interview behind her, Full Moon tries to ‘play’ a 16-year-old for the photographer, but it comes off as unnatural. Mitsuki’s nervousness is throwing her off on how to act and the break gives her a chance to go clear her head. Some local high school girls spot Full Moon standing on 16-year-old hill singing her soon-to-be-released debut single “Myself.” They comment on how good she is and ease the 12-year-old’s nerves. Mitsuki realizes that all she needs to do is be herself and no one will think she’s not the 16-year-old Full Moon. The sixth episode has Full Moon recording her first single in the studio. Meroko tranforms to play Mitsuki’s double at the home so that the real Mitsuki can become Full Moon and record her single in Shibuya. After all, you wouldn’t want the rest of the family finding out that their sick girl is running around as a new j-pop idol thanks to magic, would you? Mitsuki and Takuto arrive at the studio to see the girls lined up to cheer for the arriving band, Guitar Fighters. Mitsuki falls in line with the other fangirls until Takuto reminds her why they are there. Mitsuki transforms into Full Moon and spots Oshige waiting for her to arrive. Takuto becomes a stuffed cat-toy for Full Moon to carry around, but a curious little girl named Nanami spots Takuto the toy speaking to Full Moon. Nanami, sneaking into the studio while Full Moon is busy recording, kidnaps Takuto to go play. Full Moon spots Takuto missing and uses her recording break to start searching the area for her stuffed friend. However, Nanami isn’t going to give up her new stuffed animal without a fight. With her debut single on the radio, Full Moon is getting ready for her first concert being held in a record store during episode seven. Still in Shibuya, Takuto and Mitsuki manage to locate the store and get past the crowd waiting to see Full Moon sing. Meanwhile, Meroko continues playing Mitsuki as Grandmother and others keep looking in on her. It’s definitely not as fun as going into the city to perform. After transforming into Full Moon, the singer runs into another girl from the original audition who was sent home after Full Moon nailed the performance. Apparently #22 has been comforting herself with the idea that Full Moon was chosen for her looks and not for her singing ability. Digging into Full Moon’s self-confidence, the girl leaves Full Moon devastated that she was picked for being beautiful rather than being able to sing. 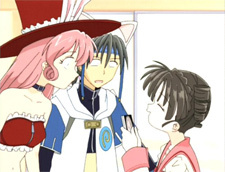 Oshige and the other staffers try to calm Full Moon’s fears over her first show. Full Moon gets made up for the concert and then disappears to the rooftop to think. 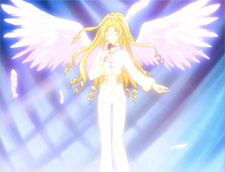 Takuto assumes his spirit-form and eventually finds the self-doubting singer wallowing in despair. Twelve-year-olds are so simple to break the confidence of. Takuto gives some encouraging words and convinces Full Moon to go downstairs and give a performance with feeling. 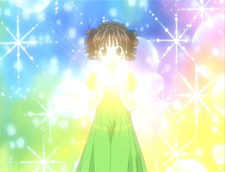 The final episode for volume 2 follows Mitsuki’s concern over how her debut single is selling. Oshige assures the singer that the sales are through the roof, but no one at school seems to be talking about the album. Meroko and Takuto try to convince Mitsuki to take her CD to Tomoe, who runs the local elementary school radio request show. However, Mitsuki can’t bring herself to do it. So, of course, Meroko produces a copy of the CD and flies it in Tomoe’s direction with Mitsuki chasing close behind. The two make it to Tomoe, but Mitsuki still can’t bring herself to ask, even with Meroko controlling the girl’s arms. The pair of shinigami convince Mitsuki to try to ask Tomoe again, but the trio happen to overhear a partial conversation of Tomoe on her cellphone, talking about the new single, saying “no good, no good.” Devastated by the comment, Mitsuki is heartbroken to think people are just humoring her by saying the CD is doing well. Meroko feels sorry for messing up the previous day and takes it upon herself to get “Myself” popular among the elementary school’s student body… by transforming into Mitsuki and selling the CD single in class. Naturally, Mitsuki doesn’t take this little event well. Full Moon O Sagashite is a cute series with magical-girl flare and is perfect for fans of Sailor Moon or Cardcaptor Sakura. The light, fluffy stories come with a deeper message to build the confidence of both Mitsuki and the young viewers. Sadly, in America this series has gone mostly unnoticed and will probably continue to do so unless a TV network picks it up for broadcast. Brick-and-mortar stores seem to carry only a limited selection, if at all, when you go looking for the DVD’s. It’s not for everyone, but there is a strong Sailor-Moon-based generation of girls who would eat this show up if they knew about it. The Japanese cast fits the part of a magical girl and her friends. myco has done a great job playing Mitsuki and providing the vocals for her image songs. If you enjoy myco’s singing voice then I would suggest checking out the work of a Japanese band called Changin’ My Life. myco provided the vocals for the group and just happen to be recording the Full Moon O Sagashite series during the same time period. The English production by Blue Water Studios ranges in the middle as an average production with some good and some poor casting choices/performances. Katie Rowan makes for a decent Mitsuki Koyama/Full Moon, but the show reverts to the Japanese vocals by myco whenever any of Full Moon’s image songs come up. Typically, the English production of a series does not get the materials to make an English version of the songs, so I cannot fault Blue Water for not dubbing Full Moon’s image songs into English. Jeffrey Watson (Takuto) and Leda Davies (Meroko) bounce between competent and so-so, dragging down my desire to give the English dub any praise; for now, it’s less-than-average with lots of room to improve. Full Moon O Sagashite: Full Moon Debuts! 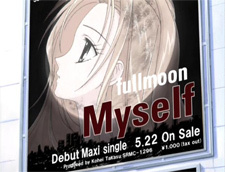 is a nice way to properly introduce Full Moon’s full singing ability and her first image song, titled “Myself.” While the series is not going to be very lovable to those outside of the shoujo realm of fandom, this would be a good choice for a series to introduce to new fans – especially young girls – who are looking for something to relate to. The j-pop idol storyline is nothing new to anime or shoujo series, so there is nothing groundbreaking in Full Moon O Sagashite. However, Mitsuki and her Full Moon alterego are far more memorable than some of the previous forays into the genre. It’s not hard to find yourself slowly being pulled in by the story of a dying girl trying to live her dream and touch the heart of a boy she once met long ago. Viz Media has done a good job with the video, but the subtitles have some odd word-spacing issues at times. The DVD’s back cover lists a manga preview, but I was not able to locate one as a DVD-ROM extra or in the DVD extras section. Full Moon O Sagashite: Full Moon Debuts! is a hidden gem waiting for magical girl fans to find it. Yet I do not expect any sudden change in the TV networks to help this cause, and it will be up to each and every fan of magical girl shows to get the word out to try this series. It’s an excellent series for shoujo fans and girls of all ages to see.